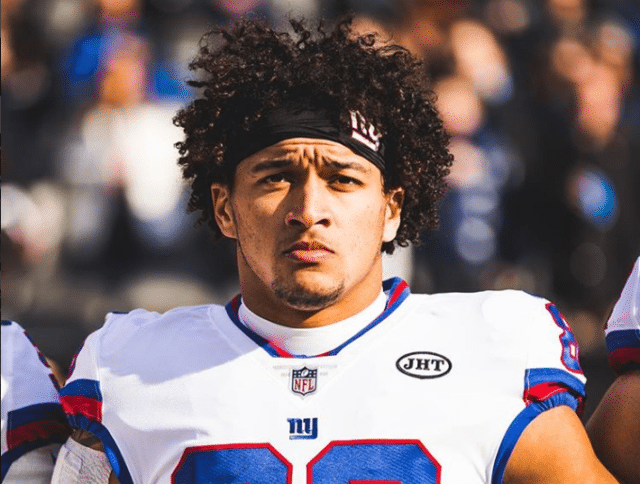 Evan Engram embraced the disciplined and heavily demanding life of American football since he was a high school kid. He’s been serving as a tight end for the New York Giants in the National Football League and as such, is one of the lucky few who have broken through to professional success in their chosen field. Before his professional career began, he played college football at Ole Miss and was from college, drafted by the New York Giants as the 23rd pick in the 2017 NFL Draft. Evan Engram was born as Evan Michael Engram on the 2nd of September 1994. He went to Hillgrove High School in Georgia. After graduating from there, he entered Ole Miss where he had a four-year career that culminated in 162 receptions for 2320 yards making a 14.3-yard average. He also had in addition to those stats, 15 career touchdowns. Despite the great career that he eventually had at Ole Miss he almost did not get in. A young Evan Engram had needed a college scholarship to continue pursuing his dreams. He didn’t get any offer until he was invited for a camp with the goal of trying out to convince the Ole Miss coach, Hugh Freeze, to consider him for a scholarship. Evan Engram worked really hard through the duration of the camp, managing to dominate any defensive back that was lined up across from him. All his hard work seemed, however, to come to naught when he was sent away from camp by the coach. Evan Engram returned home to Georgia in tears thinking that he had no further opportunity of seeing his dreams come to life. Coach Freeze, however, reconsidered and called the player back two days later to give him the scholarship that he had earned. Entering Ole Miss and having the brilliant career that he had, set Evan Engram on a sure path to the NFL. In 2014 and again in 2016, he was named as a First-team All-SEC and he also received an invitation to the Senior Bowl in the final years of his college career. He practiced really well during the Senior Bowl week going on to help the South defeat the North with a 16-15 scoreline after he made one catch for ten yards. In 2017, he was a part of the NFL Scouting Combine where he participated and completed every drill that was thrown at him. Ole Miss also put on a pro day in April 2017 that had Evan Engram focusing on positional drills. He was projected by NFL draft experts to be a first or second-round pick. In that same year, Evan Engram was ranked by Sports Illustrated as the second-best tight end in the draft. The projections of the draft experts proved to be right when the New York Giants selected Evan Engram in the first round of picks in the 2017 NFL Draft. He was selected as the second tight end, the 23rd overall after O.J. Howard was selected as the 19th overall by the Tampa Bay Buccaneers. In June 2017, the New York Giants offered Evan Engram a four-year contract worth $10.71 million with a guaranteed $5.93 million signing bonus. The Giants seemed pretty happy with their selection of Evan Engram who was actually the first tight end that they had picked in the first round since they picked Jeremy Shockey in 2002. At the end of the 2017 regular season, he was named to the starting tight end by the Giants head coach Larry Donnell. His season debut as a professional came in a game that the Giant’s played with the Dallas Cowboys. He suffered a rib injury in the 17th week of the season, but soon recovered and was back at the game again. Evan Engram’s father is Derick Engram and his mother’s name is Michelle Zelina. The two got married in 1994 and they gave birth to their son later that year. Evan has one sister named Mackenzie Engram, who plays basketball at the University of Georgia at the NCAA’s Division 1 level. The two of them had been very competitive when they were younger, challenging each other in various sports and pushing each other to succeed. While Evan Engram isn’t the footballer with the most perfect body features for the sport, his body stats are rarely considered a disadvantage as he stands at a height of 6 ft 3 in (1.91 m) and weighs 240 lb (109 kg).